Good idea. I haven't listen to Sonne Hagal in a good while! 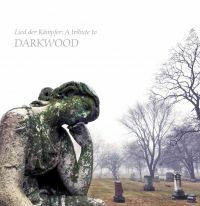 “Lied der Kämpfer: A Tribute to Darkwood” is a compilation initialized by Terry Collia of In Ruin and published in collaboration with FolkWorld, marking the 20th anniversary of the band. Nine artists from all over the world are covering one Darkwood song they liked. The compilation comes as an LP with insert and is limited to 100 copies in gold coloured vinyl and 200 copies in black vinyl. This limited edition vinyl tribute album honoring neofolk legends Darkwood features tracks by David E. Williams, Har Belex, Traum’er Leben, In Ruin, Crooked Mouth, Night Profound, Tyr-Kreis, Irmeynsul, Jerome Deppe and an exclusive live recording from Darkwood. Nine Artists from over the world are giving their tribute to the german neofolk band Darkwood. A1, A2, A5, A6, A7, + B8 originally release on 'Notwendfeuer' 2006. A3 originally release on 'Schicksalsfahrt' 2013. B1 originally release on 'Weltenwende' 2003. B6 + B7 originally release on 'Ins Dunkle Land' 2009. A4 alternative version from 'Schicksalsfahrt' 2013. B2 alternative version from 'In The Fields' 1999. B3 alternative version from 'Weltenwende' 2003. B4 + B5 alternative version from 'Flammende Welt' 2001. Limited to 200 copies; comes as a professionally printed, transparent cassette with a 2-panel J-card; no lyrics. This release has especially been manufactured to accompany the Darkwood US Tour in 2015. It contains a choice of regular studio tracks as well as some compilation tracks and previously unreleased versions. Bass, Vocals, Drums – Voxus Imp. All tracks recorded at the "Lichterflug-Festival" in Duisburg on August, 13th 2016. This is the standard version which is limited to 235 copies handnumbered 65-299.
редкое издание теперь в хорошем качестве,пусть и цифровое.оправдывает.ибо оригинал на дискогз порядка 15-30 Евро. Композиция "Ferocity" - интересна тем, что исполняется на ломаном русском языке. Вторая - "Fatherland" - ещё один славян поклон:тевтонская атмосфера неожиданно разбавляется "Подмосковными вечерами". лимитированная версия "семёрки" (первые 65 копий тиража) доукомплектована фотографией оккупированного Смоленска.